Google is experimenting with new 3 columns search results page interface. Besides the usual search results column at the center and advertisement column on the right side – there is new search options column on the left side. Since this is experimental feature, it is only displayed to random Google search users. If you prefer good old 2 column interface, following are two ways to turnoff, disable or remove new ‘Options’ left sidebar from Google Search result pages. Newer interface appear based on your search history and cookies. You can prevent it from showing by deleting all history, cache and cookies of your browser. Just goto Tools > History to delete your web browser history. (Delete history in Chrome). 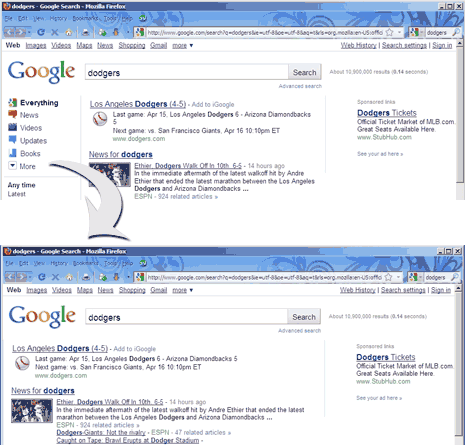 Google Chrome users can use ‘Hide Google Options’ extension to remove left sidebar on Google Search result pages. When extension is turned ON, it will only show usual 2 column Google Search interface. Old Google Search interface is still available. Just goto http://www.google.com/webhp?hl=all and start Googling in good old interface minus sidebar. in tools drop down, below toolbars there should be ‘explorer bars’. Untick google side bar – easy ! Google has completely comprimised the user experience in hopes of generating a few more ad-clicks. How lame. Remove this function or INCLUDE A HIDE BUTTON!!! I hate the new left sidebar, it’s a complete waste of screen space. i dont know where i am suppode to execute your script its not write. Thanks alot that firefox script worked like a charm..
Trashing the history, cookies, etc doesn’t work (anymore). I HATE THIS THING!!! Get rid of the left side bar . It is annoying and takes up too much screen. i hate it. God bless you!!!! Many many many thanks!!!! The left panel is absolutely annoying!!! I don’t know why google had to ruin something that was perfect in the first place!!! Again lots of thanks for your great script. I’ve found another solution that doesn’t affect other Google services and works across browsers: Go to Search Settings and change the Interface Language. You can still use English variants like Pirate, Elmer Fudd, or my favorite Bork, Bork, Bork! Once in another language the Google searches return to their old layout.